← What a busy couple of months! Do excuse the grim humour in the title but you can guess what this piece is about. Poop! I haven’t mentioned too much about this symptom of Crohn’s before but it is a significant factor and interestingly: one that a lot of people seem to be aware of. Plenty of people who when I mention Crohn’s respond with something along the lines of: “Is that the one where you need to keep going to the toilet?” Yes this is a part of the disease: the need to go many times a day and often at short notice which can be difficult, painful and embarrassing when you are not in the safety of your own home. The inspiration for me uploading this article is that my profession is a gardener, so I spend a lot of time out in peoples gardens which makes it difficult to get to a loo. Sometimes I manage it, but rather embarrassingly there are times when accidents happen. I have been caught out with letting go of what I think is an innocent little fart only to find more is there than I bargained for. Believe me this is a really humiliating thing to have happen. But it does happen. Having spoken to a friend on this I have put together a little “emergency bag” to have with me for when these unfortunate accidents happen; something I can take to work and carry around on days out to cater for said unfortunate events. 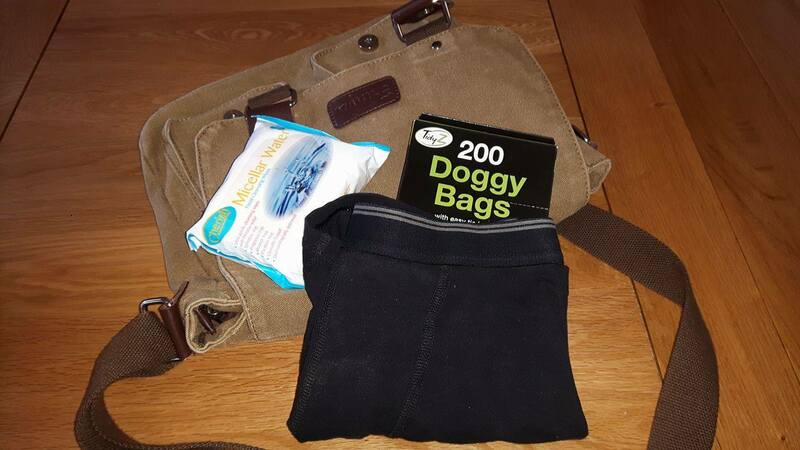 In said bag (pictured) we have: spare underwear, little doggy bags for any clothing in need of a wash and of course: sensitive skin wipes to clean up. With this small collection of articles – all easily obtainable for a few quid in any cheap shop – I think you’d be pretty well catered for if you are caught short. Being able to clean up and sort yourself out from this sort of accident goes a long way to getting over it happening and going about your day. Hopefully, dear readers, this is of some use. Its something that I hadn’t thought of putting together until recently, but finally I have done, so thought I’d share. Thanks again for reading. This entry was posted in Background information, Crohn's Diary, Lifestyle and tagged Crohn's Disease, Crohns and colitis awareness, IBD awareness, Toilet humor. Bookmark the permalink. 2 Responses to Oh! Farts are the ones without lumps, right? I like the idea, but have struggled to find a reasonably priced but decent bag to put it all in! Hi! I think that canvas bag was a cheap one I got off of eBay some time ago, and just used it because it was at hand. It doesn’t have to be massive just practical I guess. Hope this helps?